This night we are blue and we're at Blue on Highland in Needham because we are hungry and since there's no class, it's eight and not ten o'clock. I'm early and Julie's not here but they insist on seating me now though my party's not complete. They've got sports on at the bar and I can't hear it. In fact, I hear no music. Is this going to be our new favorite place? Bring on the wine. Julie picks Dona dal Cielo chardonnay fresh from Sonoma that sat briefly in oak mellowing hints of apple and orange. I order a Robledo pinot blanc. Blank covers it. Robledo's site says it's aged 30% in American oak and 70% in a steel tank and: "We think every bottle of wine produced by Robledo Family Winery is a small triumph." Really? 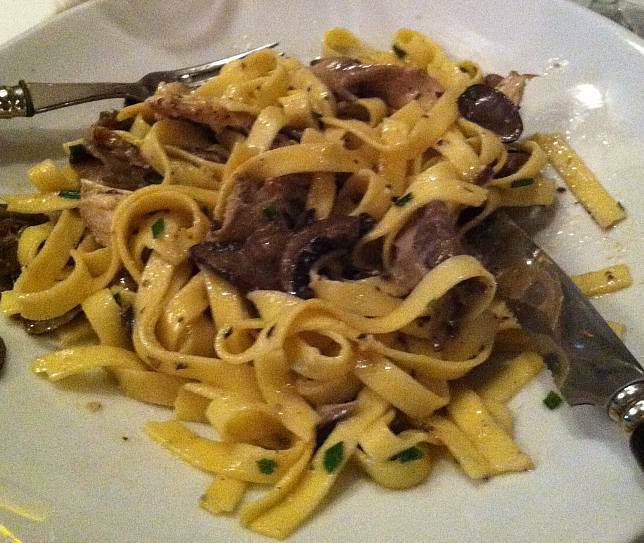 Julie has a beautiful plate of vegetarian tagliatelle with shiitake, button and oyster mushrooms smothered in Parmesan, chives, parsley and garlic. It has "fabulous texture, al dente to a fault" and I agree. Also "it feels like an honest tagliatelle" and that's interesting because I'm looking at recipes and only some use actual oyster mushrooms. Samuel Alexander, who describes himself as a guerilla gardener on SimplicityCollective.com says you can grow mushrooms at home. (I read the ten steps that debate, among other things, whether to use wheat or barley straw and it looks a lot more complicated then, say, making strudel or lasagna even.) He writes, "You need only wheat straw and oyster mushroom spawn." Only? I'll shop around. Like when I found out we need sequined shirts for recital, I went shopping immediately. Target (chic and cheap), Forever 21 (also cheap and chic), Gap Outlet and Marshalls where there is not a single sequin. On to the chichi Chestnut Hill Mall: Bloomingdale's (none, thank heavens), J.Crew (not enough sparkle), Ann Taylor, Banana Republic, where I see an neck thing I could, if I were gifted, sew on a T-shirt; BCBG Max Azria, Chico's, where a fellow dancer tries to conjure something out of nothing, and Cusp. 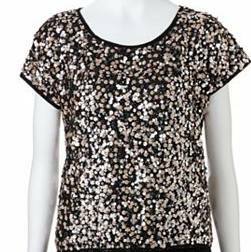 Finally, my dance friend, Lee Ann, who's a real shopper and who also needs sequins, sends a picture of a shirt that will change my life. She bought it in pink and she found it at Kohl's. I go right down and there it is. It's my very first J Lo. The point is, I was in a lot of stores and anyone who knows me will tell you shopping is not my thing. In hours of looking, though not exactly for that, I did not come across any wheat straw or oyster spawn. I'm having chicken piccata without the penne. 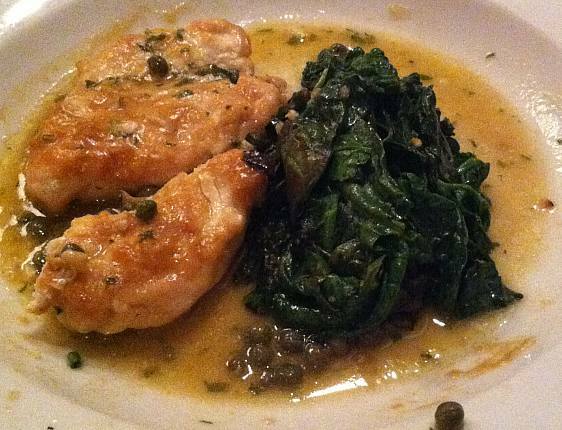 Don't you love spinach in lemony sauce with, for once, more than enough capers? Chris, our server, knows wine and uses his influence with the chef who is convinced, not happily I bet, to hold the garlic. Piccata done right goes through butterflying, dredging and browning in butter. There's lemon juice, chicken stock, white wine (and garlic). I would like to say we had the lemon créme brulee with chocolate raspberry crumble or the apple crisp with ice cream and caramel but we do not. Instead we have more wine and forget entirely about dessert. Try Blue when you're happy. You can leave all your sequins in the parking lot.